Since its release last month Marvel's Black Panther has been an enormous critical and commercial success. But while the film is replete with powerful African symbolism, it seems to have a major problem when portraying the militancy of revolutionary black politics, writes Neal Curtis. Spoiler alert: This essay contains (many) plot spoilers. Already a critics’ darling, Black Panther, the latest film in the Marvel Cinematic Universe (MCU), has gone on to achieve immense commercial success since its release last month. This is in itself important, simply for the fact that it should finally dispel the myth that Hollywood can’t afford to take risks with black leads in its blockbusters. Furthermore, this was also a film with a black director (Ryan Coogler), a predominantly black cast, and a black creative team that included costume, jewellery, make up and music. In addition to being the first ever black superhero, Black Panther is being released at a time when the President of the United States (POTUS) has publicly supported neo-Nazis by calling them “very fine people”, and the Black Lives Matter movement continues to protest the execution of black people in America’s streets. As such, the film was bound to be seen in the light of contemporary black identity politics. It did not disappoint. When the character first appeared in 1966, in Fantastic Four volume 1 #52, he not only broke the mould of white-only superheroes, but Stan Lee and Jack Kirby also presented him in a way that challenged many of the racist tropes still dominant in the comics of the day. Black Panther, whose real name is T’Challa, is king or chieftain of an African country called Wakanda that has remained hidden from the outside world and, until very recently, had not been subjected to the damaging effects of colonialism. In the story, Black Panther invites the Fantastic Four to Wakanda so he can test the defences he has created to fight off the evil Klaw who has attempted to steal the country’s supply of the precious mineral vibranium. When the Fantastic Four arrive we are introduced to a kingdom that is socially, economically and technologically advanced, a highly developed utopia that Adilifu Nama, in his book Super Black, sees as an example of Afrofuturism. The character continued to appear in various Marvel titles, fighting alongside the Avengers, until he received his first self-titled story, in the unfortunately named Jungle Action, in 1973. This first story, running from issue 6 to issue 18, was called “Panther’s Rage” and is the inspiration for the film. Having been away with the Avengers, Black Panther returns to find another Wakandan, N’Jadaka, has assumed the identity of Killmonger and is violently and cruelly attempting to subject Wakandans to his rule. Importantly, we learn that while T’Challa was away, Killmonger had been captured, enslaved and shipped to America by Klaw — who had returned to steal more vibranium. Having escaped and returned, Killmonger is committed to taking revenge on T’Challa for failing to properly protect the country and its people. When we first see Killmonger attacking Black Panther he is accompanied by his familiar white leopard called Preyy. In the comic, Preyy stands above and behind Killmonger on a rock, but is drawn to appear as if he is standing on Killmonger’s back. To understand this scene, we need to remember that the Black Panther Party was also created in 1966 and that Stan Lee and Jack Kirby had been so concerned about creating some distance between their character and this particular brand of the black civil rights movement, that they very briefly changed Black Panther’s name to Black Leopard in 1972. The appearance of the white leopard in the 1973 story is therefore no accident, and can be — perhaps should be — read in opposition the Black Panther’s liberty as the haunting or burden of white colonialism that Killmonger carries. In the film, direct reference is made to the fact that Killmonger was “born” out of the legacy of colonialism and white supremacy he experienced on the streets of 1990s America. The film opens in Oakland, the home of the Black Panther Party — the actual filming location is in Atlanta across the road from the Ebenezer Baptist Church that Martin Luther King Jr used to preach in — where we learn how N’Jadaka was abandoned as a boy by T’Challa’s father. N’Jadaka explicitly recounts how the racism, marginalisation and exploitation he experienced motivated him to help black people around the world by any means necessary. Although he doesn’t say this, the Malcom X parallel is also strong. To add extra weight to the black consciousness of his 1990s boyhood, the apartment he grew up in has a Public Enemy poster on the wall. This boy, raised in Oakland, thus becomes an avatar for the militant politics of the Black Panther Party within the film. The problem, of course, is that Killmonger’s desire to return to Wakanda and wrest the throne from T’Challa — just as his namesake did in the comic — in order to use Wakandan technology and weapons to free black people by force turns him into the villain of the piece; the inverse image of the violent colonial legacy that formed him. He becomes a black imperialist in order to counter white imperialism. 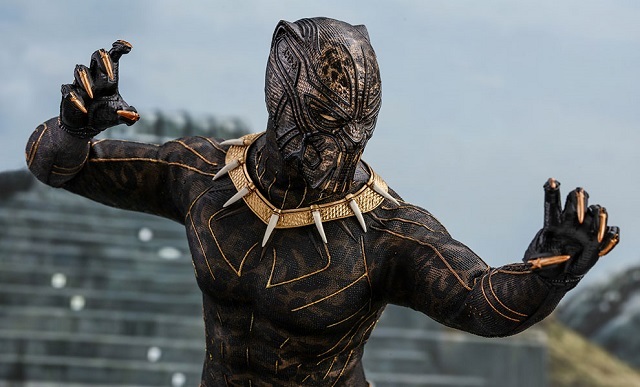 He is shown to be a tyrant at home — defeating T’Challa in ritual combat and then destroying all the herbs that give Black Panther his powers so that no one can challenge him in return — and a man who intends violent subjugation abroad, all in the name of liberating the African continent and the black African diaspora. So, while the film is replete with powerful African symbolism, such as the use of Nelson Mandela’s native tongue as the African language spoken in the film, and the use of the colours of the Pan-African flag in the casino scene in Korea (Okoye is in red, T’Challa in black and Nakia in green), the film seems to have a major problem when portraying the militancy of revolutionary black politics, despite clearly showing its causes are legitimate. In the end, the only proper course of political action we are shown in the film is T’Challa opening Wakanda to the world and practicing some aristocratic outreach. The way forward, we are told, is the generous charity of billionaires, and in that the entire logic of neoliberal capitalism is reproduced. At least that is what I thought. Another feature of the film is the incredible gender politics. At a time when POTUS is not only a white supremacist but a self-declared sexual predator, the importance of this cannot be overstated. Okoye, the warrior; Shuri, the scientist; and Nakia, the spy (and social justice warrior) are all powerful, autonomous, independent women. And yet, it was thinking about another woman in the film, Killmonger’s girlfriend, that began my reappraisal of its politics. Unlike the other three women, Killmonger’s girlfriend is entirely disposable. She is murdered by Killmonger himself in what seems to be a blatant example of “fridging”. But how is it possible that a film so conscious about its gender politics can be so crass in this instance? The most important aspect for me is that when Killmonger assumes the throne, and the Black Panther powers, he does not actually manifest as the Black Panther, but as the white leopard. He is wearing a suit that looks like an old Black Panther suit, but his transformation clearly shows he is spotted like a leopard. It has been noted that this is just another “Easter Egg” for the comics fans, but I believe it is much more. When Killmonger takes the Wakandan herb and visits the ancestral plane, as is the custom, he does not go to the spiritual world of Wakanda, as T’Challa did, but returns to the scene of his abandonment in Oakland. What Killmonger brings with him or channels in his transformation is the racism and the legacy of colonialism he experienced there. This is why he manifests as the White Leopard (let’s capitalise that now) and not the Black Panther. So, does the emasculation he experiences as a young black man tell us something about his treatment of women, and does this also say something about the politics revealed in the film? From this perspective, Killmonger is not the avatar of the Black Panther Party. Quite the contrary, He doesn’t represent the men in that organisation, or the organisation as a whole. What he represents is the blind rage that stems from the persistent legacy of colonialism; a rage that is dangerous without political organisation. In the end, while the film may indeed show us the “wonders” of aristocratic benevolence, I think Ryan Coogler is also sending audiences a coded a message about the enormous untapped potential of black politics and a call to get organised.